Don’t know how to send live photos as GIFs on iPhone/iPad in iOS 11/11.1/11.2/11.3? This guide will show you the detailed steps to send live photos as GIFs on your iPhone/iPad and also share you how to send live photos on WhatsApp. 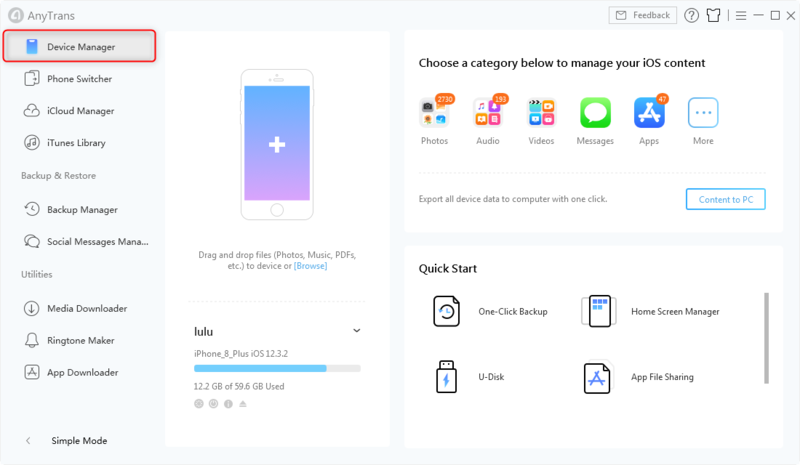 This professional & 100% safe iOS data transfer can help you easily transfer content like photos, contacts, messages, etc. on your iPhone/iPad/iPod to Mac/PC/iTunes, and vice versa. Give it a try by yourself now. 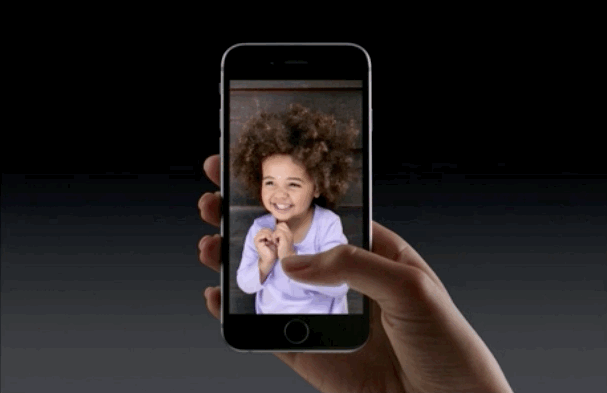 Live Photos is an awesome feature that Apple released along with the iPhone 6S running iOS 9. It gives vivid emotion with sound when capture a photo, but not just a normal photo, which makes our Albums full of vigor and vitality. However, you could only enjoy those good moments on your iPhone/iPad. If you want to export those live photos to computer or share them with your friends in their original form in iOS 9, you have to turn them into GIFs via third-party app, or it will become a normal photo. Now, with the new enhanced iOS 11, iOS 11.1, iOS 11.2 and iOS 11.3, you can turn your shots into GIF with minimal trouble, sending live photos as GIFs will no longer be a hard task. And here in this guide, we will not only show you how to send live photos as GIFs on iPhone/iPad in iOS 11/11.1/11.2/11.3, but also offer you how to send live photos on WhatsApp step by step. Step 1. At first, turn live photos into GIFs. 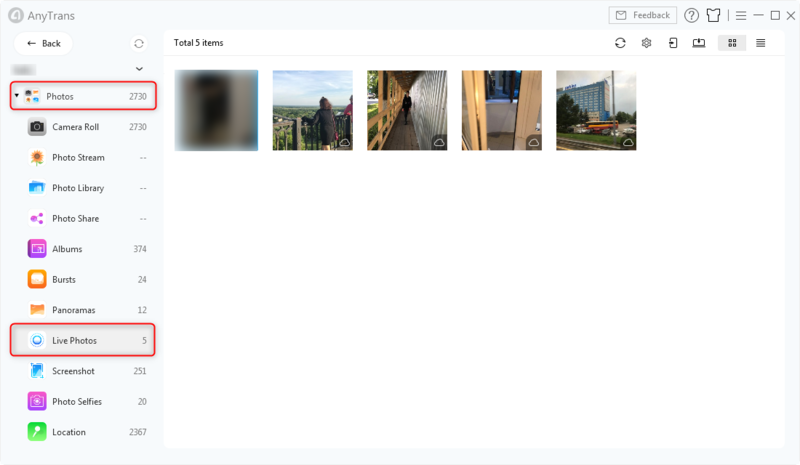 Open Photos app on your iPhone/iPad > Tap Albums and choose the Live Photos album > Select the live photo you would like to turn into GIF and choose one effort you prefer: Live, Loop, Bounce and Long Exposure. Step 2. Tap Share button on the bottom left corner of your phone screen > Select one supported app like Mail, Messages, WhatsApp, Snapchat, Instagram, etc. to send your live photos as GIFs. If you didn’t update your device to iOS 11/11.1/11.2/11.3 and stuck on iOS 10/9, you can still be able to send live photos as GIFs via WhatsApp. Simply following the steps below to see how to send live photos as GIFs with WhatsApp. Step 1. Open WhatsApp on your device > Tap on Contacts and choose the one you want to share live photos. Step 2. Start the chat and tap on (+) icon from the bottom left corner of phone screen > Choose Photo & Video Library option to enter in Photo Library > 3D Touch on the live photo you want to share, and then swipe up > Choose Select as GIF to share the live photo to your friend. iOS 11 allows users turn only one group of live photos into GIFs at a time. 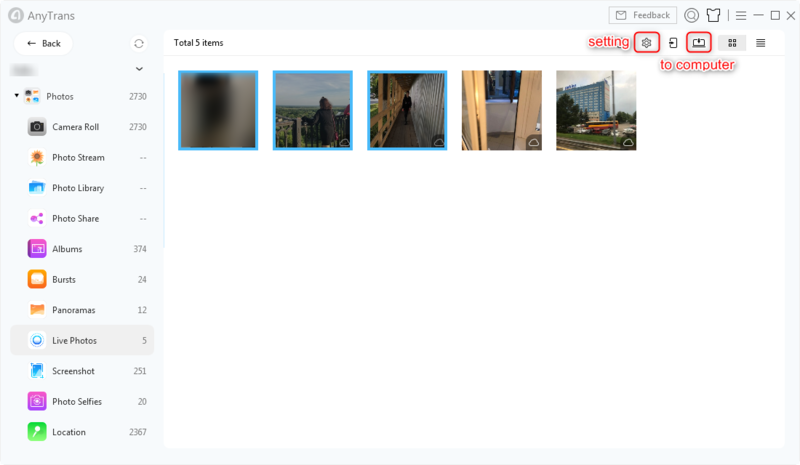 It can be a hard work to turn numbers of live photos into GIFs one by one – but not with AnyTrans. It enables you to turn multiple or all live photos into GIFs and videos at once. All you need to do is select the live photos you want to convert to GIFs/videos. Compatible with iPhone X/8/7/6S/SE and iOS 11/10/9. Step 1. Download AnyTrans and install it on your computer > Run it > Connect your iPhone to the computer via USB cable > Scroll the screen down or click the button at right. Step 2. Click on Photos category> Choose Live Photos. Step 3. Select the live photos you want to convert > Click on To Computer button > Click OK and the Settings screen will pop up > Set the live photos output format you prefer > Choose the export path > Click on Save to begin the process. Step 4. After the process is completed, you can check them on your computer. You may have succeeded in sending live photos as GIFs to your friends with above detailed tutorial. If you have any trouble on turning live photos into GIF or sending live photos as GIFs on iPhone/iPad/WhatsApp, feel free to leave your comment below and we will reply you soon.